Splash pages, you gotta love 'em. A blank canvas where the artist can hit you with a large dose of illustrated 'wow'. This week, the cosmic double page spread from one of the most fun DC/Marvel crossovers of all, Green Lantern / Silver Surfer, drawn by the definitive Kyle Rayner artist, Darryl Banks. Yeah, I'm missing the 'Kyle in that uniform' days right now. 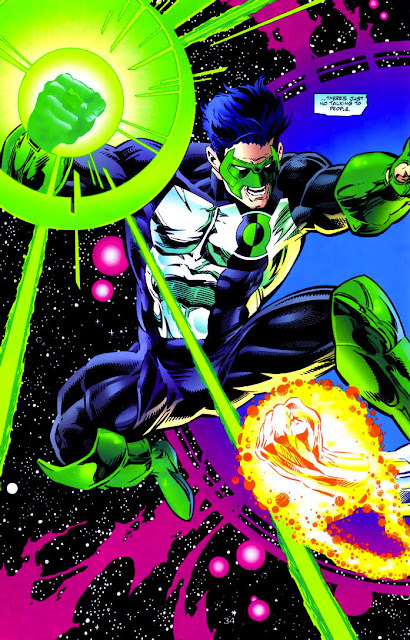 Not only was Green Lantern / Silver Surfer a long-awaited yet unexpected crossover, with Terrax, Thanos, Cyborg Superman and Parallax Hal Jordan among others, it actually covered a fair amount of ground. I always hoped for a sequel at some point, as the calm and cosmically experienced Norrin Radd made for a great contrast to the at the time brash and inexperienced adrenaline of Kyle Rayner, but it is yet to be. big time thumbs up on this one Dan! Thanks Dave, glad you like his as much as I do! That would make smashing wallpaper on my computer or a poster. Id have much preferred Hal Jordan though. Trust me Karl it does, although for Hal, that Ivan Reis dude has drawn a lot of smashing wallpaper friendly art! that is my partners fav comic he loves it so much!